York Ackworth School Ampleforth College Ashville College Aysgarth School Bootham School Catteral Hall Fulneck School Fyling Hall School Giggleswick School Harrogate Ladies College Pocklington School Queen Ethelburga’s Queen Margaret’s Rishworth School St Olave’s School St Peter’s School The Mount School The Read School Woodhouse Grove East Sussex Ashdown House Battle Abbey School Bede’s Brambletye School Brighton College Burgess Hill School Moira House School Eastbourne College Roedean School Berkshire, Oxford, Buckinghamshire Abingdon School Bearwood College Bloxham School Bradfield College Burford School Cherwell College Cothill House School D’overbroecks Downe House Elstree School Eton College Godstowe Preparatory Headington School Heathfield School Kingham Hill School Leighton Park School Licensed Victuallers Newbury Hall Padworth College Pangbourne College Papplewick School Queen Anne’s School Royal Grammar School Rye St Antony Shiplake College St Edward’s School St Georges School St Swithun’s School Sunningdale School The Oratory School Wellington College Wycombe Abbey School Kent Ashford School Beechwood Sacred Heart Benenden School Bethany School Cobham Hall School Dover College Earlscliffe College Farringtons School Kent College; Pembury King’s School Rochester King’s School Canterbury Kent College; Canterbury Sevenoaks School St Edmunds School St Lawrence College St Leonards Mayfield Sutton Valence Tonbridge School West Sussex Christ Hospital Cottesmore School Farlington School Great Ballard School Handcross Park School Hurstpierpoint College Lancing College Lavant House School Seaford College Slindon College St Andrew’s School Vinehall School Windlesham House Worth School Junior Summer Courses Windlesham School 11-15 years * 8th July - 11th August * minimum 2 weeks Location Windlesham House School lies in grounds extending across 65 acres of South Downs countryside in West Sussex. It is close to the coastal resort of Worthing and within easy reach of Brighton and London, as well as Gatwick and Heathrow Airports. 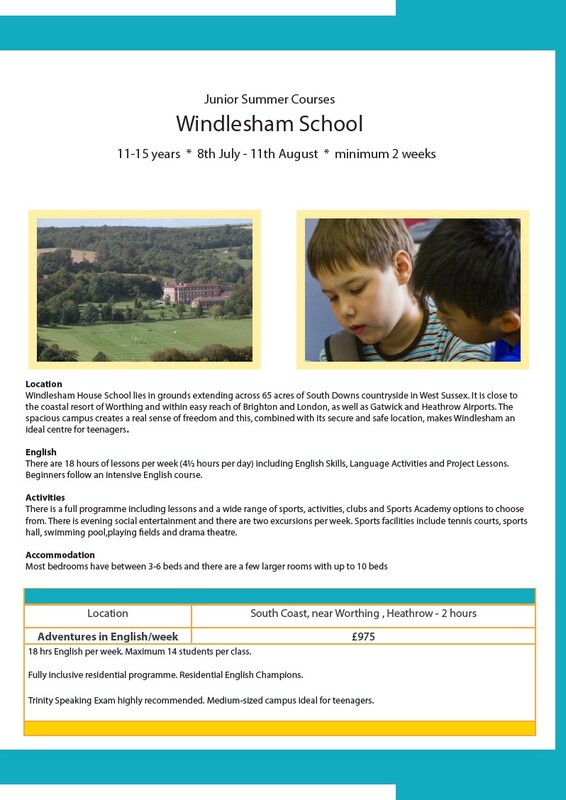 The spacious campus creates a real sense of freedom and this, combined with its secure and safe location, makes Windlesham an ideal centre for teenagers. English There are 18 hours of lessons per week (4½ hours per day) including English Skills, Language Activities and Project Lessons. Beginners follow an intensive English course. Activities There is a full programme including lessons and a wide range of sports, activities, clubs and Sports Academy options to choose from. There is evening social entertainment and there are two excursions per week. Sports facilities include tennis courts, sports hall, swimming pool,playing fields and drama theatre. Accommodation Most bedrooms have between 3-6 beds and there are a few larger rooms with up to 10 beds Location South Coast, near Worthing , Heathrow - 2 hours Adventures in English/week £975 18 hrs English per week. Maximum 14 students per class. Fully inclusive residential programme. Residential English Champions. Trinity Speaking Exam highly recommended. Medium-sized campus ideal for teenagers.